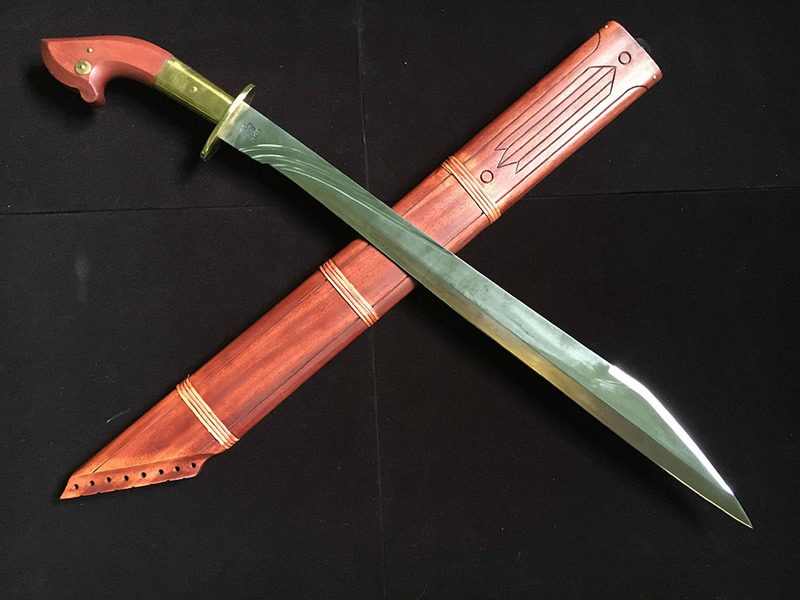 The Visayan Binagon blade originates from Panay Island in the Visayan region of the Central Philippines, most commonly used as a machete in clearing bamboo, wood, and bushes. With nine inches in the top spine sharpened blade, the Binangon is effective for abaniko (fan) techniques and delivering fast back-cuts. The blade design is influenced by *scramasax of the Europeans. (* a single-edged knife or sword used by the Anglo-Saxons). The Binangon’s blade is a one sided sharpened edge as a standard . However, we crafted its blade as both sharpened to fit for any user, either a left hander or the right hander. The handle is made out of beautiful Mahogany wood that naturally resists to any changes in humidity. An intricately carved scabbard joined along with blade to secure the sword.